AGM Director and Curator Mandy Salter announces the gallery's active role in not only recognizing but including First Nations and first peoples artists and their communities in new exhibitions, staffing and community engagement programs. The Art Gallery of Mississauga's recently hired Director and Head Curator Mandy Salter this morning made a pair of announcements -- both geared towards First Nations inclusion as an essential part of her populist mandate for the AGM. Salter announced the hiring of Reagan Kennedy – an indigenous visual culture activator with Lenape roots – as the AGM's first First Nations Community Activator. Kennedy is a multi-disciplinary artist, curator and arts educator who is inspired by her Lenape, African-American and Irish ancestry. With a strong background in community arts programming, she has worked with Station Gallery, OCAD University and the Native Canadian Centre. Her work in Exchanges and Changes: Comprehensive Narratives featured a collaborative education program with fellow artist Alexandre Nahdee, and brought together youth from various communities to create collaborative works of art on ancestral land. In conjunction with this exhibition, the AGM will present a speaker series that brings together young, vibrant Indigenous individuals and organizations that are inspiring change and pushing boundaries in the GTA. On Saturday February 27, 1 – 4 p.m, the AGM’s Main Gallery will host Joshua Stribbell and Laura Arngnanaaq of Torontomiutaujugut, an initative aimed at connecting Inuit youth in Toronto and the surrounding area in order to improve their quality of life, inspire creativity and provide the GTA with programming that will strengthen our knowledge and understanding of Inuit culture. On Thursday April 7th, from 6 - 9 p.m, the AGM’s Main Gallery will host noted Anishinaabe speaker, artist, musician and educator Eddy Robinson. An Anishinaabe Muskegowuk Cree of the Missanabie Cree First Nation, Robinson was born and raised in the city of Toronto. Like many Indigenous Canadian children, Robinson did not have an easy time as an Anishinaabe youth in the big city. Over the past 25 years of he has been active on the front lines of social service, working to advance the cause of Indigenous communities locally, provincially and nationally. Since taking the reigns of the AGM last summer, Salter has reached out to actively involve many new cultural and social community groups in the AGM’s exhibitions and programming schedule. With her populist approach to bringing people together using art as a common denominator, she is also working closely with ethnic, youth, seniors', exceptional learners and business groups, corporations based in Mississauga and all levels of government to partner on and provide support for her inclusive and indigenous community programs and events. 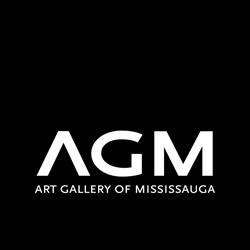 The Art Gallery of Mississauga (AGM) is a public, not-for-profit, art gallery generously sponsored by the City of Mississauga, the Ontario Arts Council, the Canada Council for the Arts, the Ontario Trillium Foundation, private citizens and AGM members. Visitors can enjoy our varied and regularly updated program of exhibitions -- of paintings and works on paper, digital art, photography, design, crafts and installations. A public gallery with a strong community connection, the AGM actively promotes interest in and learning about the arts.